Just hit 300,000 miles on my van! This is one of the best if not the best vehicle I have ever owned and I have owned many. 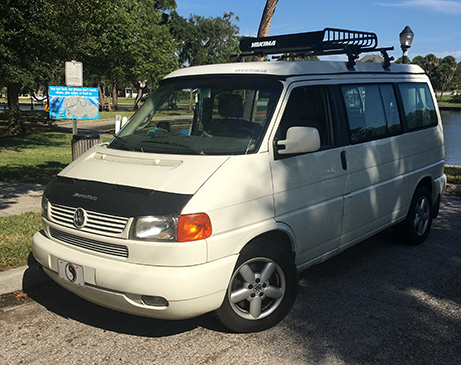 Just hit 300,000 on my 2002 VW Eurovan Weekender. Even though it has a rear seat that can change into a bed and a table and small cooler, I use it as my everyday driver since it's pretty small overall. I don't want to jinx it, but the V6 24 valve engine is still running like new with a fresh oil change every 3-3500 miles. If I ever notice any changes in running or driving, I take it in to be looked at and fixed if need be. The body and suspension is still solid with no creaking or cracking. I hope to keep it for a while yet, love this van. 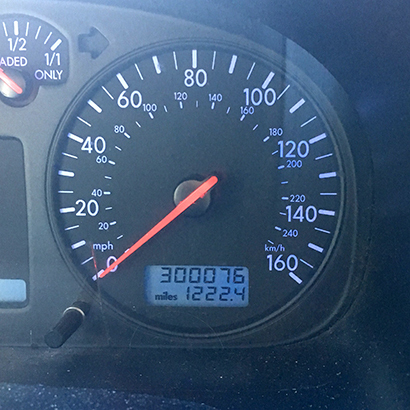 Re: Just hit 300,000 miles on my van! Rad van, man ! how many surfboards does it fit on the roof ? Cool! I'm curious to know what has been repaired or replaced. 2003 was the last year VW exported to US. They still make this van in Germany and I wish they would send them here, I would buy a new one if/when this one dies. Edited 1 time(s). Last edit at 11/08/2018 10:24AM by mstudio. Never had a surfboard on top but two kayaks fit nicely. New tires twice, brake job twice, exhaust system twice, one starter, one alternator, one AC compressor, two serpentine belts, shocks once other than the usual oil changes and fluid flushes. Biggest costs were a torque converter and rebuilding parts of the front suspension. Overall, amortized out, not bad at all. does yours open up like this? Edited 1 time(s). Last edit at 11/08/2018 10:52AM by billb. pretty cool. I had no idea these even existed. It does open like that. There is a bed up there that fits two people, on this model, you can lift the ceiling on the inside for more headroom, too. There was an MV version that did not have the lifting roof. Rear seat converts to bed, pop up table and a small cooler under the rear facing seat. Cool vehicle. ....so i the van is a rockin'......??? Congrats, JWD. Our similar vintage Toyota van has 136K miles on it... I'm not planning on living long enough, at that rate, for it to hit 300K. Looks and sounds like you take proper care of your vehicle. What's its name? Thanks, I do take good care of it. I've never named any of my cars, we just call it the bus or van. It's the progression of the first VW buses. I had a '78 Westy pop top and an '85. We traveled all over the country and Canada with those two. It's called a T4 in Europe, the first bus would've been a T1, they are at the T6 version now, that's the one in the video. Alas, no plans for VW to ship any here. I guess VW makes a reliable car once in a while! Its great that you made it to 300k. We'd have to keep our Golf Alltrack 20 years at our current rate of milage. I think a lot of people get spooked by high milage cars when they have a lot of life in them. Thing is you can't always be sure about how well it was maintained. If it has been neglected then you might be on the hook for a lot of work right off the bat. Most people who are selling a used car have not just put in a ton of money on repairs either. Agreed. I have every receipt of any work I had done, or did myself. It was $32k when new and I would still be able to get half that if I wanted to sell, which I don’t. I’m leaving on a 3000 mile trip next week and, fingers crossed, it will be uneventful mechanically speaking. I’m getting my oil changed right now and so far the mechanic has only found a tire a little low on pressure. I think there is soemthing to be said for a car with 200k miles or more. Namely, that everything that could go wrong has already gone wrong and been repaired. Of course, there is still wear and tear on drivetrain, bushings, bearings, etc. But I find that people don't touch these cars and as long as the drivetrain is solid, they are great deals. Oh yeah, buying a high milage _used_ car is completely different. I was thinking about holding on to an older car. Back in the mid-1970s, I I bought a used 1972 twin-carb VW microbus. That was a great little "bus". Edited 1 time(s). Last edit at 11/08/2018 02:55PM by testcase. Nice, that was the first year for the pancake engine. I wish I still had all of mine. Got my first one in 1968, a 1958. 100,000 miles out of brakes and tires? How the hell do you do that??? By not driving like you stole it. Edited 1 time(s). Last edit at 11/08/2018 07:31PM by RAMd®d. Exactly. I have been doing a lot of traveling the last few years, also, so lots of highway miles. I also buy really good tires and get the best brakes I can. Right on, I'm totally with you on that. I'm getting close to going over 200K on my current ride, and made it to 208,000 on a previous one. Now I'm sure everyone will chime in with how far they have gone, and that's great!